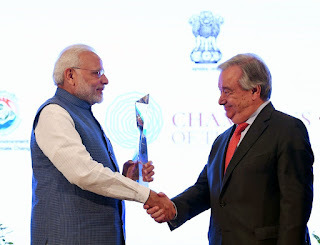 Prime Minister Narendra Modi was conferred with United Nation's Champions of the Earth Award by UN Secretary General Antonio Guterres at a ceremony in Delhi. He is among the six winners who received this award. PM Modi was jointly awarded this award along with French President Emmanuel Macron under the 'Political Leadership' category for their work in championing International Solar Alliance (ISA) and promoting new areas of cooperation on environmental action. It is UN's highest environmental recognition celebrating exceptional figures from public and private sectors and from civil society, whose actions have had transformative positive impact on the environment. It was established in 2005 by United Nations Environment Programme (UN Environment). This award programme is a successor to UNEP's Global 500 Roll of Honour. Past laureates include: Afroz Shah, who led world's largest beach cleanup (2016), Rwandan President Paul Kagame (2016), Ocean Cleanup CEO Boyan Slat (2014), scientist-explorer Bertrand Piccard, developer of Google Earth Brian McClendon (2013), and former US Vice-President Al Gore (2007). Q. Which Indian was conferred with United Nation's Champions of the Earth Award by UN Secretary General Antonio Guterres at a ceremony in Delhi?